Why is Niagara Falls sampling drinking water for lead? In July of 2007, the Ministry of the Environment and Climate Change made a series of changes to Ontario Regulation 170/03, under the Safe Drinking Water Act regarding sampling and testing of lead in drinking water. These changes required all municipalities to regularly sample and test private taps within their respective homes and businesses for lead. These requirements place an emphasis on the testing of private plumbing, which has a possibility of containing lead. Older homes may have been built with lead service lines or they may contain lead based solder, as this was a previously acceptable for private plumbing. The legislation outlines that municipalities exercise two mandatory sampling rounds per year, which take place from: mid-December to mid-April; and again from mid-June to mid-October. The City of Niagara Falls typically chooses a suitable two week window within each of the sampling round timeframes to perform their required testing. The City is actively looking for residents and business owners who are able to work within the chosen two week windows to volunteer for lead testing at their property. How is the water tested? One of our qualified Staff members will come into your home or business between 8 am and 4 pm and take a sample from your kitchen tap or another tap which is used the most for drinking/cooking water. The sampling takes approximately 35-40 minutes in total to complete. Two samples are taken from the selected tap and sent to a laboratory for analysis. 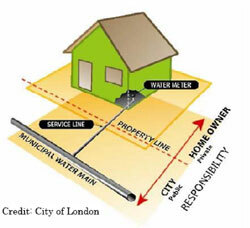 You may have lead plumbing within your structure. Lead was a commonly used pipe material up until the mid-1950’s. This could apply to a structure built before 1990. 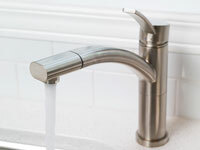 In 1989, the Ontario Building Code was amended to ban lead piping, plumbing and fixtures containing more than 8 per cent lead. The same amendment also banned the use of solder or flux containing more than 0.2 per cent of lead. The City will notify you of the results once they are received from the laboratory. What if Lead is Found in Samples Taken From My Home or Business? The City will notify the property owner of the lead exceedance results. The City will notify the Medical Officer of Health, as per Provincial legislation. Recommendations received from the Medical Officer of Health will be provided to the property owner. Actions taken on private property to repair, replace, alter or change private plumbing are the property owner’s responsibility and at their expense. If you have any additional questions or would like to participate in the Lead Sampling and Testing program please contact Jessica Blanchard, Environmental Services Coordinator at 905-356-7521 ext 6209 or jblanchard@niagarafalls.ca.